I found out today that the Teleport wont load the login window while on Mojave it just sits there with a blank window. (not sure if this "UpdaterStarupUtility" is related). Anyone have any ideas how I can get it working again? @shawn-osborne It is a beta firmware. I don't think even the Amplifi team has had a chance to even test out their devices on it yet. I'm sure they will push an update as soon as they can. @Shawn-Osborne, @Arie-Mark: I don't know if we'll be fixing this, as the web UI will de turned off soon anyways. We're moving to in-app setup over Bluetooth. Third party captive portals could still have this issue, but it's out of our control. @ubnt-gunars -- macos 10.14.3 is not beta anymore, and I can confirm: it cannot connect to teleport. not talking about web-ui setup, this is connecting to a configured and working teleport at all. other devices (phones, etc) connect to teleport, macos connects to amplifi-hd and other wifi ... just not via the teleport. see case notes for 137841 etc. UPDATE: v2.9.3 for the teleport (available today) unfortunately doesn't seem to have fixed this issue. 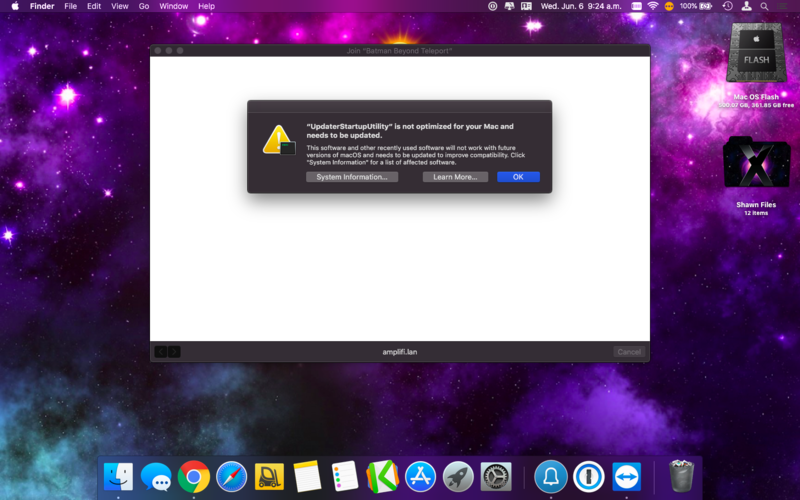 UPDATE: the macos 10.14.4 beta that apple released today appears to let teleport connect properly. @rob-vanhooren Thank you for the update. 10.14.4 is a beta release though so I want to test on public 10.14.3 to make sure users who are not on beta don't experience any issues.